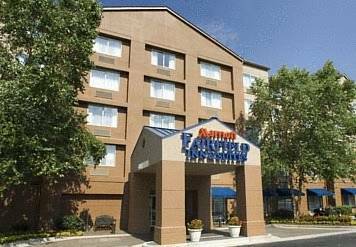 Experience the comfort of intuitive service, well-designed accommodations and complimentary amenities at Fairfield Inn & Suites Atlanta Perimeter Center. Our hotel's central location puts you near top dining options and is within walking distance of Perimeter Mall and the Dunwoody MARTA Station, servicing downtown Atlanta. In addition to convenience to local transportation options, we offer a complimentary shuttle service to destinations within a 5-mile radius of the hotel. Recharge in our modern rooms and suites with complimentary Wi-Fi, plush bedding and flat-panel TVs boasting premium cable and movie channels. Start your morning off right at our complimentary breakfast buffet before taking advantage of our fitness center and indoor pool. Our Corner Market is open 24 hours for anytime cravings. At Fairfield Inn & Suites Atlanta Perimeter Center, youre our #1 priority. Ask us about The Fairfield 100% Guarantee , where we promise you'll be satisfied or we'll make it right. That's our commitment to you.